How do we creatively re-imagine the productive presence of ghosts in the coolie archive? 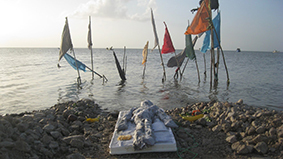 This photo essay revisits the early experimental period of Indian indentureship (1845- 1848) in Trinidad through artistic installations—based on the transcripts of an inquiry into coolie misery and death. The author conducts a creative ‘archival ethnography’ to think about questions around coolie transience and the in/visibility of absented presences in the official record. In doing so, the essay attempts to stage an affective-political circuit of intelligibility to contemplate the ghostworld of indentureship. It is this ghostworld (as another worldliness) that is crucial for understanding the coolie archive as living, contiguous, and counter to official knowledge production. Arondekar, A. 2009. For the Record: on Sexuality and the Colonial Archive in India, North Carolina: Duke University Press. Berlant, L. 2007. ‘Slow Death (Sovereignty, Obesity, Lateral Agency)”. Critical Inquiry 33, no. 4: 754–780. The National Archives. 1846. CO 295/153: Trinidad 1846. Volume 4: Mr. Walkinshaw’s ill-treatment of Coolies. Governor Lord Harris Dispatches 75 and 88. London: The National Archives. Ellapen, J. 2018. “Queering the Archive: Brown Bodies in Ecstasy: Visual Assemblages, and the Pleasures of Transgressive Erotics”. The Scholar and Feminist Online, 14(3): pp. 1-16. Gordon, Avery. 1997. F. Ghostly Matters: Haunting and the Sociological Imagination. Minneapolis, MN: University of Minnesota Press. Gosine, A. 2017. “After Indenture”. Small Axe 21, no. 2 (53): 63–67. Kempadoo, R. 2008. ‘Amendments: A Fictional Re-Imagining of the Trinidad Archive’. Journal of Media Practice, 9(2): pp. 87-99. Look Lai, W. 1993. Indentured Labor, Caribbean Sugar: Chinese and Indian Migrants to the British West Indies, 1838-1918. Baltimore, MD: Johns Hopkins University Press. Wahab, A. 2010. Colonial Inventions: Landscape, Power and Representation in Nineteenth-Century Trinidad. New Castle Upon Tyne, UK: Cambridge Scholars Publishing.